Photographer Captures L.A.'s Vintage Homes The pictures by the 98-year-old architectural photographer Julius Shulman are in a league of their own, so distinctive that they are consulted by movie designers, collected by museums and cherished by homeowners who commission them. 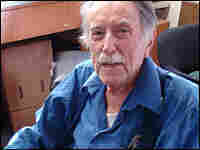 Julius Shulman at work in 1960. Shulman rearranged the breakfast dishes to create this portrait of Shondell Spiegel's Hancock Park home. 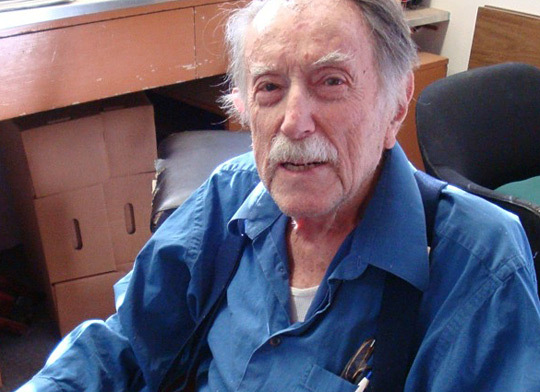 Shulman poses in his office. The 98-year-old photographer continues to photograph L.A.'s homes. Magazines, newspapers, even family scrapbooks are full of photographs of houses — graphic examples of the American dream. But pictures by the 98-year-old architectural photographer Julius Shulman are in a league of their own, so distinctive that they are consulted by movie designers, collected by museums and cherished by homeowners who commission them. 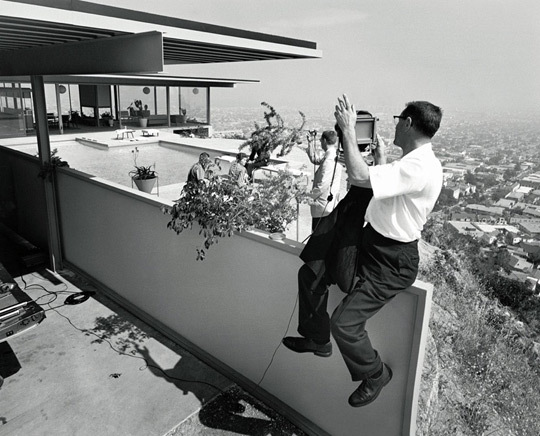 In the movie Iron Man, the hero lives high atop a California hillside in a supersleek house inspired by photographs Shulman took in the 1950s and 1960s. "You have to reference him when you're doing what we do," says J. Michael Riva, the production designer for Iron Man and Iron Man 2. "He's the only one who really catalogs all ... these extraordinary buildings. If it wasn't for him we wouldn't be able to see them." Shulman himself lives high atop a California hillside in house off Mulholland Drive that he built in the 1950s. It's a clean, modern house that looks a bit like some he has photographed. At home, the photographer fields calls from magazine editors, architects, photography students and acolytes. Sometimes Wim de Wit, the head of architecture and design at the Getty Research Institute, phones. In 2004 the Getty bought Shulman's archive — some quarter of a million images documenting over 70 years of California architecture. "The famous architects like Frank Lloyd Wright and Richard Neutra and Rudolph Schindler had already been building in this part of the world for quite some time," says de Wit. "But after the Second World War there was a whole generation of architects that became known thanks to [Shulman's] work." Shulman has taken thousands of photographs, mostly of houses in Southern California, but it's best not to ask him about going on a shoot: "Shoot?" he jokes. "Look at me. Do I have a gun? I'm a photographer." Sometimes there are people in the pictures, but Shulman's focus is on the building — how it sits in its environment, the feeling it evokes. 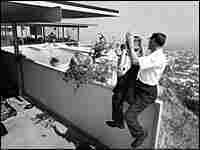 His most famous photograph, called Case Study House No. 22, was taken in 1960 and shows a house in the Hollywood Hills. Designed by Pierre Koenig, the house is one of several affordable single-family homes commissioned by an architectural magazine after World War II. 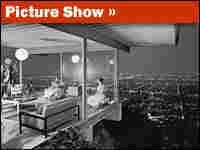 Shulman's picture shows the glass-walled corner of the living room, suspended from the edge of a cliff, hanging in space over the twinkling lights of a Los Angeles dusk. Two attractive women in white dresses sit on 1950s-modern furniture, looking ready for cocktails. You can almost hear Sinatra on the phonograph, and taste the martinis. The photographer calls it "one of my best pictures I've ever had." He remembers photographing the interior of the house, then walking outside to look at the back of the structure. "And I said wait a minute, this is better. Look at the line, the perspective, the cantilever. It all comes together," he remembers. "So I called to my assistant [and] told the fellas to the bring camera and reset the lights because we're going to make a different composition." Shulman's photo captures the iconic Los Angeles of our dreams — the glittering, slightly scary, edge-of-the-continent feel of the future. In LA Magazine, Mary Melton writes that the photographer "gave Los Angeles its best self, and then exported its mythology to the world." For $6,000 or more, you can commission Shulman to photograph your home. Steven Spielberg did, as did director Robert Zemeckis and my friend Shondell Spiegel. Spiegel lives in Hancock Park, a lovely old neighborhood just south of Hollywood. She remembers Shulman and his partner, Juergen Nogai, coming to her house one morning to take pictures. She had set up coffee and fruit for them, but when she started to put them away, the photographer stopped her. "He said, 'Bring me three knives. Bring me three forks. Bring me three cups,' " says Spiegel. Shulman says he doesn't do a lot of staging; it's all spur-of-the-moment spontaneous with him. 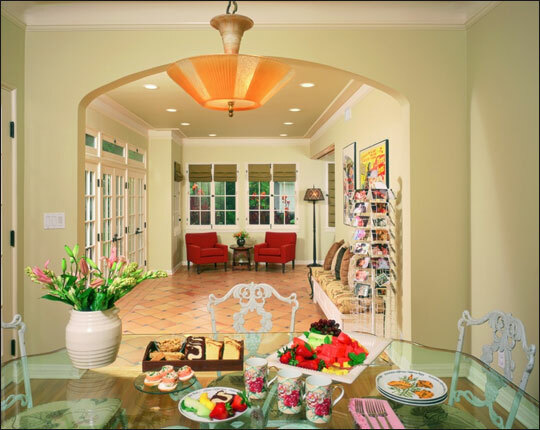 In Spiegel's house, he rearranged the leftovers and created a tablescape that echoed the archway and colors of the breakfast room. "He makes you see what you take for granted. And we do that in our houses. We do that in our marriages. We do that with our children," says Spiegel. "He has ability to stop time and let you see it and to remember why you fell in love with it." Whether it's a home in Hancock Park or the Department of Water and Power in downtown L.A. or a gas station in Anaheim, the camera of photographer Shulman discovers the indelible image, documenting not just a time and place, but an essence.